Trump’s golf courses: “On fire” or in the rough? NEW YORK - Eric Trump cut the ribbon on a new clubhouse at a golf course on Monday and said his family's golf empire is doing "spectacularly," but the few public numbers available suggest tough times in the second year of his father's presidency. 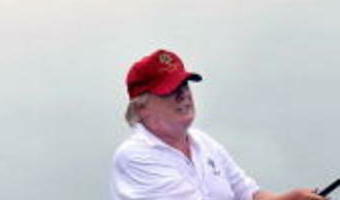 Trump and his brother Donald Trump Jr. opened the clubhouse to cheers at the Trump Golf Links at Ferry Point in the Bronx after arriving by the Trump helicopter near the 18th hole. They hope the new building that replaced a temporary tent at the 3-year-old course will boost its fortunes. Data from New York City obtained in a Freedom of Information request by The Associated Press show revenue at the city-owned course in the shadow of the Whitestone Bridge fell 7 percent last year, echoing some disappointing figures at other Trump resorts. But just how Trump's golf business in general is faring is difficult to tell, given that the company is private. The Trump Organization has made a big bet on golf in the past decade, spending more than a … [Read more...] about Trump’s golf courses: “On fire” or in the rough?